Robots on Mars - Solar System Planets And Moons Section. Future Robots May "Hop" Across Mars. NASA's Spirit rover has just completed a long hard slog across difficult Martian terrain to reach the Columbia hills. The short journey of just a couple of kilometres has taken Spirit months. Imagine if it could thoroughly analyze an area and then just pick up and fly somewhere new? NASA has awarded a contract to a proprosal from Pioneer Astronautics, which envisions a vehicle that could land on Mars, refuel with local materials, and then fly hundreds of kilometres to explore; repeating this process over and over again - the Martian Gashopper Aircraft. Part lander, part aircraft, the gashopper (no, not grasshopper) is a unique concept being considered by NASA for future robotic exploration of Mars. Unlike landers, such as the Viking spacecraft, Beagle 2, or the upcoming Phoenix lander which can only examine a few square metres of ground, the gashopper could land, perform scientific analysis and launch itself back into the air to fly hundreds of kilometres to a new location. The gashopper would get its electricity from a large set of solar panels built on top of its wings. It would use this electricity to retrieve carbon dioxide from the Martian atmosphere, and then store it as a liquid inside the aircraft. When enough gas was stored up to make a flight, it would heat up a hot bed of pellets and then pass the CO2 through it. Now hot, the gas would act as a propellant, and allow the gashopper to lift off vertically from the surface of Mars. 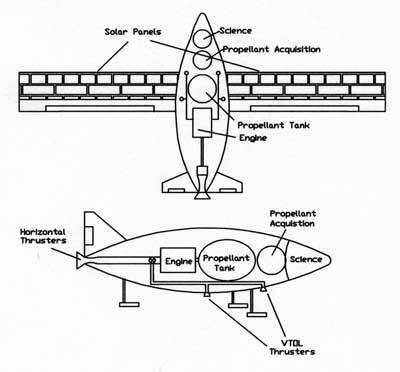 Once airborne, it could then fire more gas out a rear thruster and begin flying as an airplane, using its large wings for lift and manoeuvreability. When it was ready to land, the aircraft could slow its airspeed, and then touch down gently as a vertical lander. The proposal comes from the mind of Robert Zubrin, author of The Case for Mars, President of the Mars Society, and the President of Pioneer Astronautics. It's one of 219 research projects selected by NASA for Small Business Research and Development contract awards. Zubrin sees the gashopper not only as a technology for exploring Mars, but as a proof of concept for many engineering challenges that NASA will have to overcome in future missions, both robotic and human. "If we're going to do a sample return mission, we'll want to know how to make propellant for the return journey," explains Zubrin, "and the gashopper will also let us test many liftoffs and landings with hazard avoidance in all kinds of terrain. "The gashopper will be using native carbon dioxide for fuel, so it won't contaminate the soil with hydrocarbons," continues Zubrin. This is important, because spacecraft from Earth using hydrocarbons for fuel could contaminate the landing site with chemicals that could confuse the search for life. "Once the gashopper gets moving, it'll find a pristine Martian surface to explore." The simplest gashopper could actually be quite light, as little as 50 kg (110 pounds). Compare this to the current Mars Exploration Rovers, which both weigh in at 185 kg (380 pounds). Tack on some more weight, and the gashopper could carry a few mini-rovers, like the tiny Sojourner that visited Mars as part of the Pathfinder mission. These could be targeted at the most interesting features based on the gashopper's aerial reconnaissance of the area. Mars landers Image credit: Pioneer Astro. Another advantage of the gashopper is that is could completely ignore terrain. When NASA selected the landing sites for its Mars landers, it purposefully chose locations that were relatively flat, so the rovers could drive at a useful speed. The gashopper could land at the edge of a deep chasm, examine the area, jump down to the bottom and get back out again. It would give scientists unprecedented range and flexibility when searching for evidence of past water or life on Mars. Of course, there's a catch. 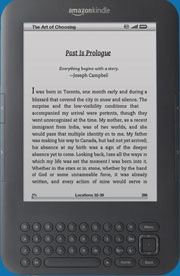 The limiting feature of the gashopper is the electricity required to pressurize and heat the carbon dioxide propellant. This process consumes a lot of power, and the gashopper would need more than a month using its solar cells to refuel and recharge its batteries before it could take off again. To generate more electricity, NASA could consider using a Radioisotope Thermal Generator, similar to those carried by Cassini, the Viking landers, or the upcoming Mars Science Laboratory (due for launch in 2009). With a more powerful electrical system, the gashopper could lift off every few days, and essentially be able to roam the entire planet of Mars. 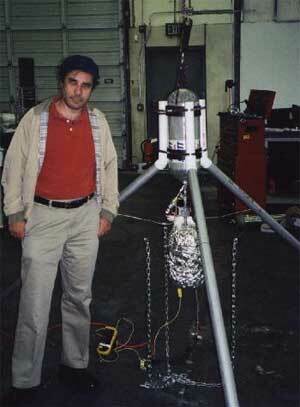 Zubrin's company, Pioneer Astronautics, has already done a significant amount of testing and research for the concept, and they developed a prototype ballistic gashopper for NASA's Jet Propulsion Lab in 2000. The engine worked well in the lab, and they were able to get a remote-controlled vehicle with a mass of 50 kg to fly in a simulated Martian gravity (using a helium balloon to provide stability). Instead of sitting on one spot, or slowly crawling across the surface of Mars, future robotic explorers to visit the Red planet may take to the skies and soar. Well... hop, anyway.